Although I didn’t think anything could top “In Fairleigh Field,” I was wrong. “The Tuscan Child” earns my highest accolade, a rating of “Rattling Good Read”! I should know, since I stayed up most of the night enjoying it. This book hit all my hot buttons–a secret dating back to World War II, an English protagonist, delightful descriptions of Italian food and scenery, a burgeoning romance–what could be better? Thoroughly recommend this to everyone who longs for a good read on a rainy night. Or any other kind of night. If this novel by Rhys Bowen doesn’t grab you by the eyeballs and keep you reading untill the very end, IMHO, you’re a lost cause! It’s not a true mystery as such, but it certainly is a mystery. I did manage to figure out a couple of things before they were revealed. I won’t tell you who/what/where/when because I don’t want to ruin the story for you. Wonderful characters; wonderful plot; wonderful locations. Just a wonderful story all the way around. If you ever been to Italy, you’ll recognize the terrain, the food, the wine. And Vin Santo! If you’ve never had Vin Santo or Lemoncello, go out and buy yourself a bottle of each immediately!!! I first became acquainted with Bowen from her series about a Constable in Wales–sorry I can’t recall his name right now–and became a fan. I could never quite get into the other ongoing series she writes, but her stand alone novels are outstanding and well worth a read. Thanks, Rhys, for hours of reading pleasure! Sometimes I must post my review the minute I have closed the book on the last page. 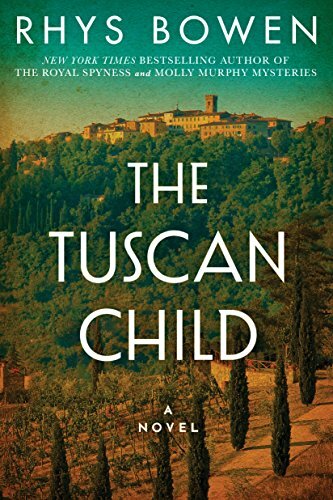 The Tuscan Child by Rhys Bowen is one of those gems. I have several books by Ms Bowen sitting on my bookshelves that have not been read as yet, my bad. The Tuscan Child flips between two different eras throughout the novel. Starting with Hugo Langley, a son of the aristocracy, a husband and father brought down with his mates in the late part of WW2 in the mountain region of Tuscany, the only one to survive the wreck with a bad leg as a result. The second character we meet in the early 70’s, his daughter, Joanna who must deal with the remnants of her recent loss of her estranged father Hugh who was ‘existing’ in a portion of the Family Estate in the English Countryside, the Lodge which was lent to him when he became heir to the estate but unable to pay inheritance taxes to the Crown(which many families have found various ways of dealing with).He was forced to sell the estate to a local private school. Joanna going through his belongings finds a returned letter to a Sophia in Tuscany which upon reading , piques her interest in their relationship and refers to a ‘golden child’. Having inventoried the remaining family possessions, including several paintings, Joanna decides to put off her exams to be eligible for the bar , leave said possessions with her barrister(Nigel Barton), and takes off to unravel the mystery of her father’s time spent during the war, and what happened to the Sophia, and her child or children. All of the parallel life histories tell us much about these two, and all the characters that they weave into their stories. So we learn more initially than they do, but not all except they are somehow all connected, the good, the bad, and the potentially nasty or are they ? Let me lead the reader to have the satisfaction to unravel all the mysteries, that befall Hugh, Sophia, Joanna and others ..This is where I take my leave with the most urging that if you want to disappear with an exceptional book, and follow the narrative..who am I to stop you…I STRONGLY ENCOURAGE YOU TO DO SO!